Today is November 1, 2017. We’ve got about 60 days left in the year to finish strong. Or not. We’ve also got about 60 days left to plan a solid start to 2018. Or not. CEOs and business owners started thinking about 2018 months ago. You likely were formulating plans for 2018 this past summer. That doesn’t mean you weren’t thinking about, or planning for 2018 last year, or earlier. Some businesses have really long cycles. Like manufacturing, or pharmaceuticals. Success – even failure – can take a long time. And like any plans, clarity arrives the closer we get. Mostly because we have to get clear as deadlines or important dates grow closer. Let’s start with the finish. For some companies there are about 60 days left in the fiscal year. For others, the end of December will wrap up the end of their Q3, with a year end wrapping up at the end of March 2018. No matter – we’ve got a limited time as we close out 2017. No matter how lackluster the start, every business wants to finish having hit the forecasted numbers, building sales momentum to launch into 2018 and pile on as much profit as possible. 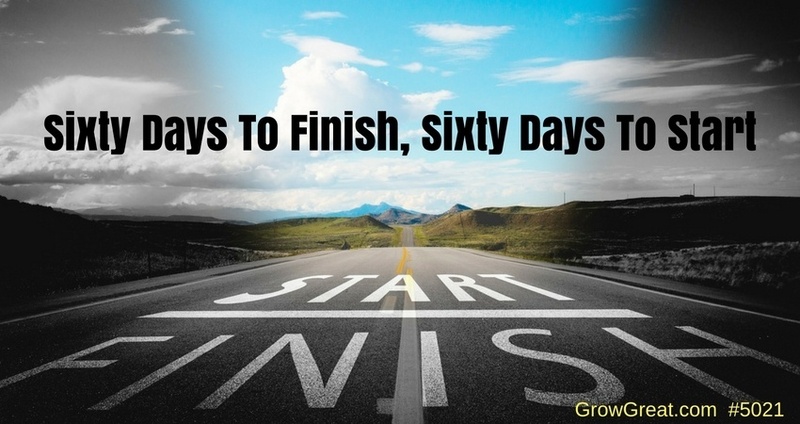 Sixty days left to improve your key measurements is important. Every Day Counts. Every Person Counts. There are some things we can do as business leaders to make full use of limited time. Like now. First, we can make sure to spread the positive message of making every day matter. Whether it’s accounting projects that need to be completed, or sales that need to be made – every day matters. More when we’ve got limited time. Everything is compressed and pressurized when there are only two months remaining. Don’t burn today because you’re going to experience some days where your mileage won’t be very good. The holiday season provides distractions. Distractions that you can’t ignore. Instead, you’re better off embracing them depending on the culture that you’re building, or maintaining. I hope your culture is high performance based. And I hope your employees are fully engaged, loving their work and mostly doing the best work of their lives. But that’s often idealistic. And it just isn’t happening. These are the days where you can really impact your culture. If you want to lead in the most positive way – and surely you do – then these are the days to show employees how much you care about them. As people. Every single day treat them as humans. It’s tempting to live by the “mush, mush” motto, behaving as though you’re driving a team of dogs in the Iditarod race. You’ll be tempted to think it’s the right strategy for getting the most out of your people, but it’s the fastest way to ruin good culture, or prevent yourself from ever establishing great culture. And you’ll lose your team, if not literally, emotionally and mentally. Don’t do it. Instead, make every day count by getting your people to connect and collaborate. Don’t ignore the need for people to provide insights and contribute to solutions that can make 2017 end on the highest notes possible. Try gathering people in brief sessions where you refrain from holding forth, but where you ask them how the company can take full advantage of the next 60 days. Nothing formal. You don’t want to put people on guard, especially if you’ve not been doing this regularly (what’s your problem?). Just stand up huddles where you ask people to give their ideas on things you can do TODAY, and every day as you do your best to finish the year as successfully as possible. Listen. Ask questions to make sure you clearly understand. Summarize what you hear them saying. Thank them. Genuinely and sincerely thank them. Don’t walk away without praising them. Everybody appreciates affirming words of encouragement and praise. It can’t be contrived though. Make it sincere and heart felt. Say it the way you want, then let them get back to work. Employees hate it when the work piles up placing them under an even bigger burden. Be respectful of their time and work load. Keep people informed. What’s our speed? How’s our oil pressure? Are there any warning light flashing on our dashboard? Few things demoralize people more than being clueless about how well they’re doing – or how well the company is doing. Keep your folks informed. It starts with establishing the standards, the goals and objectives. People have to know what they’re aiming at first. Then they have to know how close or how far away they came to hitting the target. It’s your job, as the leader, to let them know the score and how they can improve it. Daily performances add up to provide our year-end results. Don’t neglect or forget the people behind the performance though. It’s culture and it’s critical to your success, both as a leader and as an organization. Now. Make it personal. Make it individual. The people behind the performance are the fuel behind everything your organization accomplishes. Don’t loose sight that they’re people – real humans with real human emotions, feelings, thoughts, ideas, dreams and expectations. You can avoid “messing” with all this soft stuff, or you can embrace it and leverage it for everybody’s benefit. I clearly urge you to do the latter. I don’t care how many people you lead, make time for people. If you’re running a global billion dollar company with 10,000 employees then you’ll have to scale this in a way that best works for you. But most of us won’t have that problem. A few, a dozen or more, hundreds of employees can be engaged in personal, meaningful ways. Find a way. Because it’s important. What does it look like? It looks like whatever you can make it look like and whatever people need. Don’t forget the “what people need” factor. Open your door and invite people in for 10 minutes, 5 minutes. This isn’t a “let me tell you how you can be better for me” talk. It’s you, the leader, showing genuine interest in THEM. It’s you wanting to know how they’re doing. It’s you wanting to find out where they want their career to go next year. It’s you finding out what’s working for them at work, and what isn’t — and why! You’ll need courage to do this, especially if you’ve not done it before. You’ll need to start doing it and expect yourself to be more skillful after some practice. Ask, then listen. This is an enormous opportunity for you to learn about the real people who work for you. Who are they? What do they most care about? What are their ambitions? What are their passions? You’ve got people working for you right now who have talents you’re not leveraging. People with interested and skills you’re not leveraging because you don’t know about them. They can reach new heights of happiness and productivity AND you and the company can benefit. You just have to mine the gold that already exists in your people. Sixty Days. Make them all count. Make every day and every person count. Let them know they matter and you’ll be amazed at how much you, and each of them, will grow. Together, you’ll grow your enterprise, too.